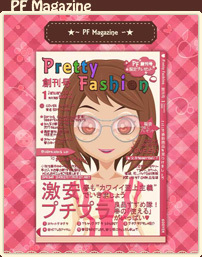 Pretty Fashion - Basic Collection is a game distribute on 2011. 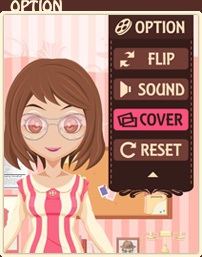 This is totally free of iPhone, iPod Touch & iPad for female fashion dress up game, player should dress & drag to dress and undress Outfits, T-Shirts, Hairstyles, Glasses, Shoes and so on. We will prepare to update more and more in coming seasons as soon as possible. 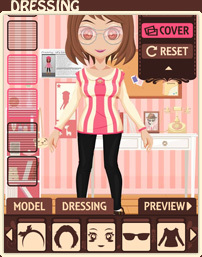 The Game have 2 Model record to let player to free to change, player can save as two different set of dress. Player only require tap "Model" Button then select which model you change is OK.
For different season, we are design spring and summer style dressing, which is referent Japanese and Korean fashion. 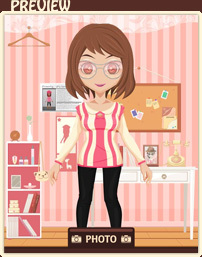 The Game we have total 10 different type items to lets player to customize, they are "Skin Color", "Hairstyles", "Face", "Outfits", "T-Shirts", "Skirts", "Pants", "Socks & Shoes", "Headdress", "Glasses", "Scenery". Player should base on their interest to change and wear which item. We have designed and provided "Cover" Feature, player can select Option > Cover, to show the model inside of our design fashion magazine cover. Let everyone focus on her. We have designed and provided "Preview" Feature to let player have more enjoy the model without any interface, also player can take a snapshot for model, the snapshot will store in device default camera album. Your suppot is our motive power. Let's us know how to improve Pretty Fashion? Email us! info@pick-tech.com.